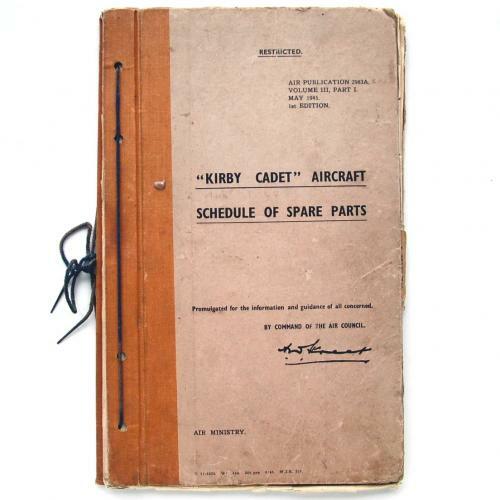 'Kirby Cadet' Aircraft Schedule Of Spare Parts. AP2983A & B, Volume III, Part I, 1st Edition, May 1945. H/b, 21 x 34cm, looseleaf format. Marked 'Restricted'. Contains a complete list of parts embodied in the 'Kirby Cadet' MKs. I & II trainer glider including those in the aerofoils, alighting gear, controls, fuselage, struts and bracing and release gear. For each is given the reference number, part number, nomenclature, quantity and material specification. The parts are also shown in diagramatic plates at the rear of the book. Whilst this manual was initially for the MK.I only it has been amended c.Oct. 1946 to include the MKII. Further amendments are noted through to November 1946. The cover is a bit soiled and the edges creased/worn. The pages have edge wear/creasing and small tears but the manual is perfectly legible and in reasonably good overall condition. Originally designed by Slingsby, the Cadet first flew in 1935 and was used as a RAF and ATC trainer. Stock code P18571.